A live set I recorded in Chichibu 2009 will be aired on Greta Cottage Workshop Radio on Soundart Radio 102.5FM on Saturday February 19 at 22:00 GMT. To access the show visit their website, click on “Listen” and download the 3mu file in order to listen via iTunes or the VLC player. 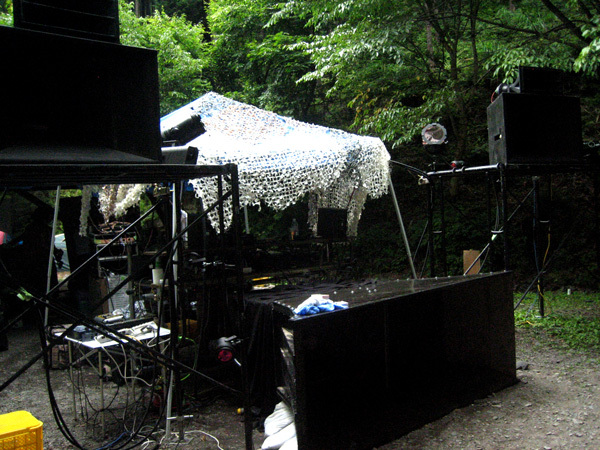 For the past 5 summers or so I have been playing a very special outdoor party deep in the mountains of Saitama, Japan. The crew who run it are bona fide techno heads and long time supporters of my music. They get together once a year, haul a home made audiophile sound system with a 90 kilogram sub-woofer across a small river and have a mini-outdoor festival at the Asami Campsite in Chichibu. It is always a blast and an inspiration. The music and sound are sublime and great care is taken in choosing the line up and DJ schedule. This set continues my Chichibu tradition of playing a kind of audio practical joke on the audience somewhere in the performance. This running joke is a parody of my reputation for crazy breakdowns and weird sonic elements and it has become a staple of my Chichibu sets. One year for example, during a breakdown, I morphed the track into playing the Radio Taiso broadcast which is an early morning calisthenic program aired daily on radio in Japan – so in the middle of my set I had the whole dance floor doing these cheesy morning exercises which almost all Japanese know by heart. Radio Taiso is associated with elementary school, old people and salarymen so we were all laughing our asses off – imagine suddenly doing I’m a little tea pot and the accompanying moves in the middle of a blistering techno set and you’ll get a good idea of the situation. With this featured set I explored a tribute to Michael Jackson with a twist. I decided to use Billie Jean because that is the downbeat that started it all for me and I mashed it up with excerpts from his Oprah Winfrey interview. In the interveiw, which is now very difficult to find online, Oprah is chatting with Michael in and around rooms in Neverland and throughout the tour of the house he is boyish and coy but in one scene in his indoor theatre, when Oprah prompts him to sing A capella, he suddenly bursts out beat boxing intensely and laying down some breathtaking vocals. He transforms right in front of the camera, it is like two people in the same body, and the switch from one persona to the other is mind boggling. I thought it would be interesting to take this moment, this revelation of Michael’s pure and innate talent (exposed by the very media that haunted him) and juxtapose it with a quintessential youtube one hit wonder/virtuoso performance of some random salesman selling a plastic MIDI Keyboard by demonstrating its drum sounds with an explosion of unexpected musicality. A plastic toy pushed beyond its limits is a warped metaphor for Michael Jackson’s later life, I think, and despite the shocking way he was treated in the media he has always been one of my all time greatest musical inspirations.